Welcome to the official Buena Park FFA Website. Established in 1956, Buena Park FFA is in the heart of Buena Park, CA. We are a part of the FFA Orange Section and the Southern Region. Support California Ag Education by purchasing a CalAgPlate. Money goes back to support Ag Education and FFA! Click on the picture for more information! Buena Park FFA NewsCheck out below what our chapter has been up to this week! We had 18 students receive their State Degrees this year. This degree is the highest degree earned within the chapter level. Students that get this degree have done over 500 hours within the projects and have received over $1000 profit. They have been involved within FFA at all levels of the chapter, section, region, and state levels. Students that continue with an agriculture-related project/career after high school can earn the highest degree in the nation: the American Degree. Our students also excelled in their Proficiency areas for their SAE Projects (Supervised Ag Experience Project). We had 14 proficiencies go to the sectional level and 12 are going to be going to advance to the regional level. Proficiency scoring consists of students filling out an application that explains their SAE project, their responsibilities, the money they have made and their future goals / how their project will relate to their career goals. At the scoring, students applications go against other students who have projects in the same category/area. Each application is read carefully, scored and a top individual is picked to move onto the next level. Below is the list of students that are moving onto regional scoring (Southern Region is everything below the "grapevine" and down to the border/coast/state lines). If you see any of these students, please give them a "high five" -- this is a HUGE accomplishment! These proficiency applications will be scored on February 11th to see who will move to the state level. * Fun Fact: Edwin Madrid is a graduate and is still involved in agriculture up in Modesto and is attending MJC. Edwin had the STATE WINNING title in Pomology Production (Fruit Trees) last year. He is currently working on his America Degree. We took 18 students to MFE (Made for Excellence) & ALA (Advanced Leadership Academy) this weekend. Students participated in leadership opportunities, built their communication skills and career growth by participating in a 2-day conference in Ontario. Students had a blast learning about their own leadership skills, how to build on them, and how to bring them back to their chapter. Students also discussed ways to make their chapter activities better, create new ones and discuss agricultural issues across the state and nation. ALSO, our very own Kelly Cotlegde interviewed to become a regional officer for the Southern Region. Kelly is currently the Vice President for the Orange Section. This is a great accomplishment in being interviewed for a position as a Regional Officer. 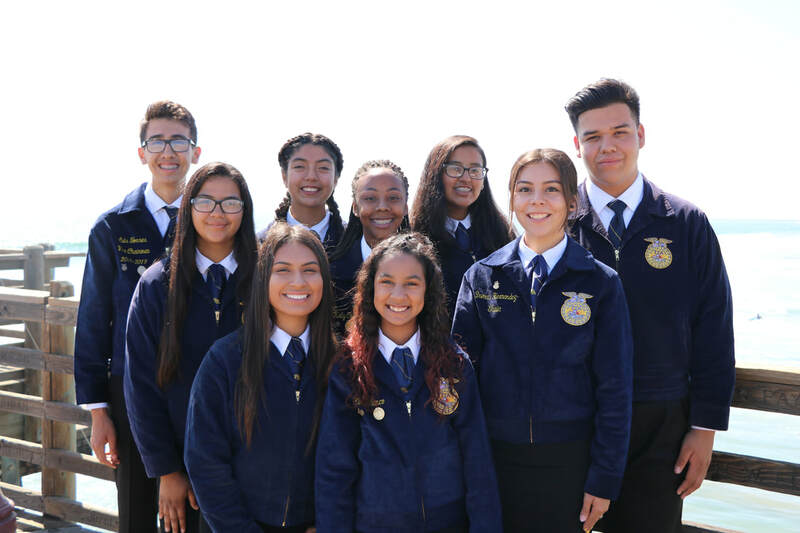 All in all, Buena Park FFA is making great strides! We had the highest amount of state degrees and proficiencies this year than past years. We had the most proficiencies move onto the regional level compared to other schools in our section. We are currently working hard coaching over 16 students for our public speaking event that is occurring at the end of February and have students preparing for their judging competitions that are being held throughout the spring semester.